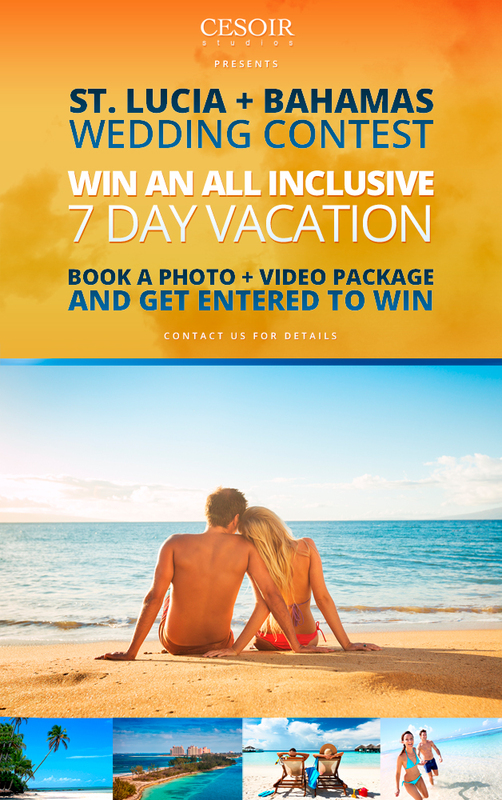 all inclusive vacation to either the Bahamas or St. Lucia. The client must book a photo and film package with a minimum spend of $5000 (before taxes) to be entered into the contest. A minimum of 15 contest bookings must be received by March 31, 2015 for the contest to be valid. The resort in St Lucia will be a choice between: Coconut Bay Resorts & Spa and St. James Club Morgan Bay. The resort at the Bahamas will be the Melia Nassau Beach Resort. The final destination will be chosen by the winning couple. The resorts have a minimum star rating of 4 or above. The maximum spend for the vacation value by CESOIR studios will not exceed $5000. The drawing will be recorded on video and presented to our couples via our website, facebook page and other social media accounts. The time in which the vacation will be booked will be from April 20, 2015 – June 15, 2015 and Oct 1, 2015 – Nov 20, 2015. Or the couple can choose to book during the same dates in 2016. The winning couple will need to record 3 videos about their experience. One at the airport/plane before they leave. One video of the experiences they have at the resort. One video about their thoughts on the trip when they get back.